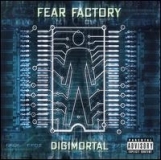 FEAR FACTORY - DIGIMORTAL (CD) | Online Shop | Wizard LTD.
Digimortal is Fear Factory's fourth studio album, released on April 24, 2001 by Roadrunner Records. It is considered a concept album and a sequel to Obsolete, their previous album (which was itself a continuation to Demanufacture) and the final part of a trilogy. This was the band's last album before officially breaking up in March, 2002. Frontman Burton C. Bell had decided to quit after putting out this album, but the band reformed later in the same year to put out their next album Archetype in 2004. Digimortal was the last to feature founding guitarist/songwriter Dino Cazares for 7 years until he came back.